Strip-building - assembling a pile of thin wood strips into a functional hull - has been a popular canoe-building method for many years. Now, boatbuilder Nick Schade, an engineer by training and a self-professed sea kayaking addict, has refined this time-tested method to build the more complex shapes of sea kayaks. The method is simple, forgiving, allows a liberal amount of design flexibility, and requires a minimum number of tools. It's also relatively inexpensive: about $500 to $600 for one of the designs discussed here - one-quarter the price of a factory-built model. In The Strip-Built Sea Kayak" Schade presents full plans for three elegant designs inspired by the grace and seaworthiness of the Inuit and Aleut skin boats. 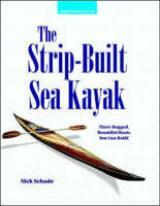 Profusely illustrated instructions provide the details that will guide you through the process.A complete novice will be able to construct a finished kayak after reading nothing but this book. And for an experienced builder the techniques here can be expanded to create the perfect boat.